Man, the mighty sure have fallen this season. It seems like just yesterday Ghost was riding high. He was out of the game, his business was flourishing and him and Angela were finally together in the way they always hoped to be. Yet just like that, Ghost's life has been thrown into absolute chaos. And he has no one to blame but himself. 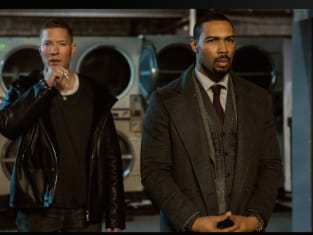 We've seen Ghost with his back against the wall, but nothing has ever been quite as bad as what happens to him on Power Season 3 Episode 7. And to think, he STILL doesn't know Kanan is alive. Ghost is literally getting crap from every angle of his life. Milan has completely flipped the script on Ghost's entire life and Ghost is struggling to keep his head above water. Right now him and Tommy need to be on the same page about untangling themselves from Milan, but it's no surprise that Tommy is keen on doing his own thing. I knew the Ghost and Tommy reunion would be complicated, but I didn't count on just how crazy Tommy was going to go after Holly's death. Tommy has always been an irrational, dangerous, hothead but now you add in resentment and self-loathing and suddenly you've got a whole new beast to deal with. Ghost is going to have to rein him in if there is going to be a chance to defeat Milan. But now that Tommy knows Holly was pregnant (thanks, Tasha), it's going to be even harder to get through to him. By keeping him alive, Milan is banking on being able to use Tommy at his will, since he sees what has become so evident; Tommy feels as though he has no reason to live. The only person with a shot at giving Tommy life is Ghost, but his mind is in about fifty different places right now. 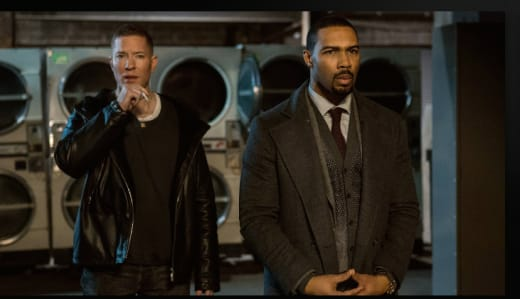 After the emotional ending of Power Season 3 Episode 6, I thought we'd get an hour of mopey Angela, but she had no time to mourn her middle school love affair ending, as she was being whisked away to work. The Lobos train wreck was now being investigated by the Office of Professional Responsibility, as they were looking to find the dirty agent on the task force. Those lawyers were making some compelling arguments against everyone when they were doing their interrogations. If I didn't already know Sandoval was the rat, they would have had be convinced it was Knox. They brought up one of my questions from last week, why wasn't he shot in the head like everyone else? It's not surprising that Knox and Sandoval threw Angela under the bus, I mean, what choice did they have? Knox especially has been done trying to help her and he's pretty much right about a lot of his theory, minus Angela's involvement in certain things. I rag on Angela a lot for all her many workplace mistakes, but she does not deserve to go down for this Lobos mess. I know she told Ghost Lobos was alive and threatened Ruiz, but other than that, she was fighting the good fight to bring him to justice, right? Right?!?! It looks like Ghost may be instrumental in clearing Angela's name, as the Office of Professional Responsibility is looking to meet with him as well. We know Ghost can schmooze with the best of them, but I worry for him in this situation. With only three episodes left, Ghost needs a miracle. Dre is finally becoming relevant, since he's the only one that knows Kanan is alive! I had a feeling Ghost icing him out would come back to bite him, but I really did hope that he would tell Ghost about Kanan, because he's not dumb enough to believe Kanan is just going to let bygones be bygones. Speaking of Kanan, he was at it again, killing an old lady like it was nothing. I truly hate him. What is this whole trip down memory lane thing he was talking about? If it's something I missed, please enlighten me in the comments! Milan is one sick dude and at this point, he's the baddest villain on this show to date. When Ghost walked around the corner and saw him AND the "dead" waitress in his living room, my head was spinning. That dude is one step ahead at all times. Whenever Angela and Tasha talk, I feel like my life is complete. The disdain and snark is off the charts and I need more Power Gods! I'm over Tariq and his piss poor attitude and defiance. So I'm beginning to think this season is headed towards a major death that is going to really rock the show, more so than Holly, who was only relevant to Tommy or Lobos. And I'm thinking it will be Tariq. He has had WAY too much screen time and I think there's a reason they want the audience invested in him. His death would have profound ramifications on all four of the main characters and really shake up Ghost. Thoughts? We're coming down the home stretch people! What did you guys think about "Don't Go?" Will someone finally figure out Sandoval is the rat? What is Kanan's plan? What's next for Ghost and Angela? Share your thoughts in the comments and watch Power online right now if you're behind!